The other day I came across this list of common cooking mistakes, several of which apply specifically to healthy cooking techniques. Guess which ones I make? I’ll give you a clue: most of them have to do with trying to speed through the cooking process when a bit of patience is warranted. Like here. See tip No. 7: overheating milk can cause it to curdle. 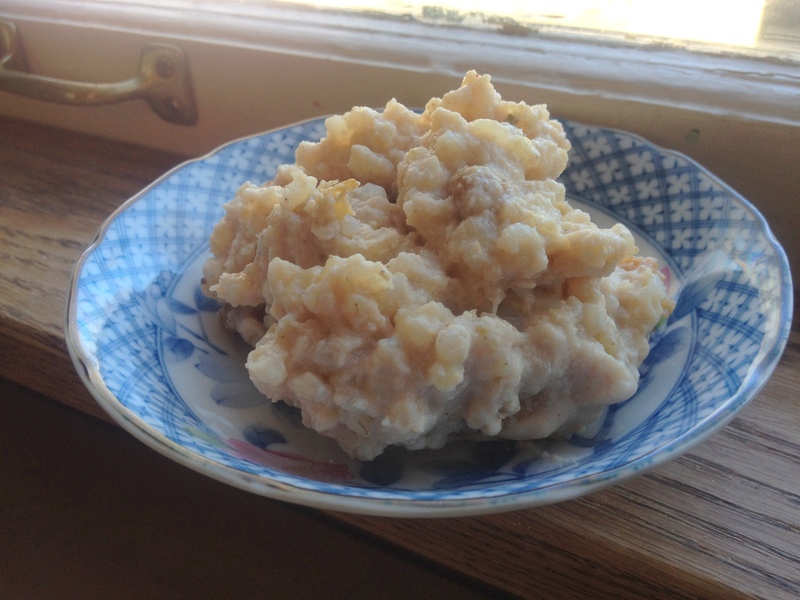 So take it slow when you make this rice pudding. Or use cream. And in another classic do-as-I-say-not-as-I-do move, I’m going to advise you to reheat any leftovers of this dish gently for breakfast, thinning with a little milk if necessary. But then I will admit to you that I couldn’t wait and just scooped a bowl cold from the fridge, and that wasn’t half bad either. Brown Rice Pudding with Golden Raisins: Warm 4 c. milk over medium-low* heat with 2 Tb. sugar, 2 Tb. honey, 1 tsp. vanilla and a pinch of each cinnamon and cardamom. Stir frequently* until the mixture reaches a steady simmer, then stir in 2-3 c. cooked short grain brown rice, a nice pat of butter, and a few handfuls of golden raisins. Continue to cook at a low* simmer, stirring frequently, until the mixture thickens, the raisins plump, and the rice is nice and creamy, about 30 minutes. *Seriously. Low heat. Keep stirring. Don’t allow the pot to boil or the milk will curdle. Ask me how I know. This recipe is based on one from Joy the Baker, who also dabbles in making puddings from other sorts of rice. Check it out if you ever find yourself with leftover rice begging to be turned into dessert. This entry was posted in Breakfast, Desserts and tagged breakfast, children, cooking, dessert, DIY, family, food, homemade, kids, lifestyle, recipes, vegetarian, whole grain on March 21, 2012 by emmycooks. Yum! Would it be ok without the rasins? I love em, but I am the only one in my fam. It would be more than fine without the raisins. You could substitute another dried fruit, or serve a soft fresh fruit over it, or leave it completely plain. Love brown rice pudding! This looks so comforting. And I’m totally guilty of going too fast in the kitchen!! Do you make it with coconut milk? I love that. Or is there another vegan version you prefer? I love rice pudding. Yummy, yummy! I too am guilty of several things on that list. Primarily not reading a recipe through before starting it. I think that is why I advocate it so strongly: because I don’t want people to make the same mistake that I routinely make! Like starting dinner at 6 for guests arriving at 7 and realizing that lamb shanks take four hours to cook. Or cracking all the eggs into the bowl before realizing I was only supposed to use two first, and then the rest later. Mostly, I am guilty of crappy baking because I routinely ignore exact measurements. One day I’m going to make a beautiful flat-topped cake that doesn’t resemble a mountain! I’ve never tried this kind of pudding with brown rice. Besides being healthier, are there taste benefits that might sway me from my white rice world? Even after all these years, I still make plenty of mistakes. I haven’t posted much lately, partly because I’ve now messed up the same cake recipe twice. First time I used coriander instead of cardamom, and then when I made it again on Sunday it turned out great taste-wise, but stuck in the bundt pan and half the top tore off. Not exactly photo worthy! Hoping third time will be the charm! Absolutely the best use for leftover rice!! I adore. Frugal? Check. Resourceful? Check! Delicious? For sure! Excellent. Mmm, when I cooked a lot of Thai food I used to make a black sticky rice pudding with coconut milk and palm sugar that was amazing. You are definitely headed toward deliciousness. If you have a big carton of coconut milk, is that the same kind of coconut milk that I get in a can, or something else?